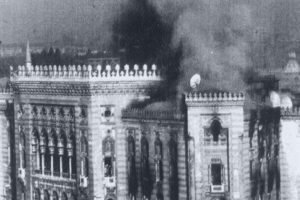 All of the scenes depicted in Les désastres come from the final, desperate ‘May Days’ of the Commune, when many of the great landmarks of Paris were burned to the ground. The printer Badoureau established himself on the rue Sainte-Isaure in the 18th arrondisement, conveniently located just north of the Seine and at the heart of the battle. The fact that the artist Edouard de La Tramblais chose to render the most famous buildings (the Palace of Justice, the Place de la Bastille, and the Place de la Concorde, for instance) and that the captions were given in both French and English suggest that this work was intended from the start as a war souvenir. 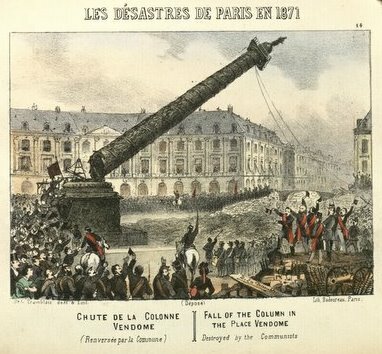 The most well-known image to come out of the Siege of Paris is the destruction and subsequent collapse of the Vendome Column. As a symbol of the hated Second Republic the column was one of the first targets of the Commune. After the crushing of the revolt it was rebuilt and became a symbol of the folly of the Communards – a prototype of the way visual symbols change meaning in our own time.